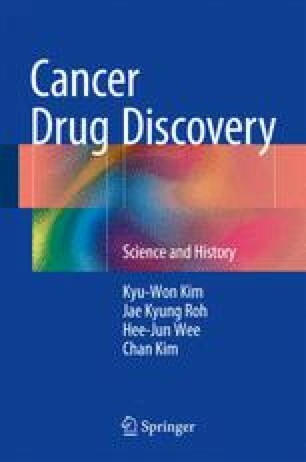 Natural product anticancer drugs that are used clinically include compounds isolated from plants such as the vinca alkaloids, taxane/taxane analogues, podophyllotoxin derivatives, and camptothecin derivatives, as well as anticancer antibiotics isolated from various Streptomyces species such as anthracycline/anthracenedione, bleomycin, and actinomycin (Fig. 6.1). Vinca alkaloids and taxane/taxane analogues exhibit anticancer effects by inhibiting the microtubule function of spindle fibers, which is related to chromosome segregation, while podophyllotoxin derivatives, camptothecin derivatives, and other antibiotics cleave DNA bases, causing DNA damage through the suppression of topoisomerase I or II and the production of free radicals.